One of my retirement goals is to never have to buy snow tires again! Yes, I like to keep my life ambitions simple and modest. Always have. But, where to spend the winters? I remember looking at a map of the world before I retired and reading up about where people who live in the northern hemisphere go to escape the cold. Europe seemed like a good option. But online temperature stats for the months of January, February and March didn’t look too promising, except for some of the Mediterranean islands. We took a cruise there in the fall of 2013, my first retirement trip, but didn’t find what we were looking for. We visited friends who wintered in Mexico, near Cancun. It’s a beautiful area but we’d have had no car and our favourite fitness pastime, cycling, would not have been an option. None of the six countries we toured in Central America fit the bill either. Arizona? Maybe, but we’d miss the ocean. And so, it came down to Florida. Pros: accessible by car; cycling opportunities; beaches; accommodation options; weather. Cons: traffic; exchange rate; finding suitable rentals each year; the American way of life. In 2016, we took the plunge and rented a condo for the month of January. In 2017 and 2018, our stays grew to six weeks and, for 2019, we booked the same condo for two months, January and February. Last August, I received a text from the condo owner out of the blue advising that she’d changed her mind. No explanation! Back to square one! Try and find a place to rent four months out? Not an easy task. Long story short, we’re staying in a mobile home park called Poinsettia, a nice place with a community feel to it, and home to very friendly people. The location is excellent. Residents are solidly blue-collar, not snobbish like the condo crowd. While our unit is very dated, we’ve gotten used to the place and remind ourselves every day how lucky we are to be able to escape the worst of an Island winter. We plan to return here in 2020, in a nicer unit hopefully. Any place is what you make of it; a positive attitude and an open mind go a long way. Elva and I ride three or four times a week with our cycling group, the Caloosa Riders Bicycle Club. Rides take place almost every day and we choose a group according to ride speed. The terrain is dead flat and winds are usually moderate. Traffic is an issue for sure, but you’re either comfortable riding on the road or you’re not. We are. We absolutely love downtown Fort Myers. Older buildings have been lovingly restored, much like they have in Charlottetown. There’s something going on every weekend: bike show, art show, car show, food festival, music festival, etc. Twenty-three metal sculptures by the Columbian artist Edgardo Carmona are displayed throughout the downtown area and they attract a great deal of attention. We spend a day on Fort Myers Beach every week and we take in a movie at least once a week. Life is good! We’ve met many people in Fort Myers and some have become good friends — Canadians and Americans both. I’ve discovered that a key to fitting in here is to purposefully avoid four topics: politics, religion, gun control, and health care. Most Americans we’ve met know very little about Canada, and what they do believe is often tainted or outright false. As a result, it’s difficult to have an informed two-way conversation on these topics. To illustrate, a cyclist I met for the first time began our conversation by asking me where I was from. He said that his daughter had done post-graduate work at UBC. “The school was fine,” he said, “but she didn’t like Canada”. “Oh!”, I replied. “No, she couldn’t carry [a concealed handgun] and didn’t feel safe there.” What do you say to that? Last week, I came upon two of my cycling buddies I’d wrongly assumed were Trump supporters. They both looked at me, shook their heads, and said how disappointed they were with how their leaders were behaving. These are sensitive times in America, and Americans are divided on many important issues. I hold strong opinions on the four topics mentioned but keep them to myself. When someone tries to draw me into a conversation, I politely decline, saying only that I’m a visitor and that we enjoy spending time here. When it comes to the television news outlets, it’s all Trump all the time! CNN is anti-Trump, Fox News is pro-Trump, and MSNBC falls somewhere in the middle. I distinctly remember turning in at 11:00 pm on November 8, 2016, secure in the knowledge that Hillary Clinton would succeed Barack Obama as President of the United States. The silver-haired CNN genius, John King, had guided viewers through a seemingly inexhaustible series of impressive electoral maps, declaring definitively that “There is no path to victory” for Donald Trump. I slept well knowing that. We all know what happened the next morning! And so, we watch the circus unfold every day. The same talking heads that predicted a Clinton victory explain how the noose is tightening around the Trump team. (I’d have fired every friggin’ one of them after the 2016 election.) The Mueller Inquiry indicts yet another campaign insider and the talking heads smell blood. “This time, they’ve got him”, they hint. Trump manoeuvres and creates yet another diversion: régime change in Venezuela; peace talks with the Taliban; withdrawal of US troops from Syria; new hope for a trade deal with China; a second summit with Kim Jong-Un. We watch as the wily Nancy Pelosi teaches The Donald a hard lesson about the realities of governing the world’s most powerful nation. He sticks to his plan to build The Wall and to have poor Mexico pay for it! Yes indeed, truth is stranger than fiction. We’ve created a bubble for ourselves, a place to spend a few months each year. It may not be luxurious but it’s home for now. The internet makes it much easier to stay in touch: to read La Voix acadienne and The Guardian; watch Compass; FaceTime with friends and family; and even watch Netflix. We have each other, warm days, and lots to do. It is indeed true that home is where the heart is! We leave home in a driving rain storm and roll along Highway 102, watching the weather turn for the better, hoping it will hold for the next day’s Gran Fondo, third in a row for Elva and I. The Annapolis Valley has had a hold on me since my first visit in 1978. The sight of ripening fruit in heavily-laden orchards is evidence of the bounty of nature and the hard work of those who farm the land. My genetic memory is triggered as we drive past Grand-Pré, home of the National Historic Site, and Port-Royal where my Gaudet ancestors first settled in the 1600s. Still dark when we sit in the dining room. Check out the tin ceiling. Gran Fondo registration seems busier than last year’s. No wonder! Over 1,000 riders have pre-registered for the event. I look at the board listing where people are from: 400 or so from Halifax; 22 from Prince Edward Island; all 10 provinces represented; 11 states and the District of Columbia; and Australia, Great Britain, Germany and Austria. Word of the event has spread far beyond La Baie-Sainte-Marie. Volunteers are everywhere! All of them offer you a smile and seem genuinely to enjoy what they’re doing. Pride in the event and the community shines through. Elva and I eat our fricot and talk to people sitting at our table. Two women are from Vancouver. Another is from Richmond, B.C. She introduces us to her friends from four U.S. states, high school buddies where they grew up in the Philippines. “I’m doing the Medio tomorrow, but we really came for the lobster,” she admits. 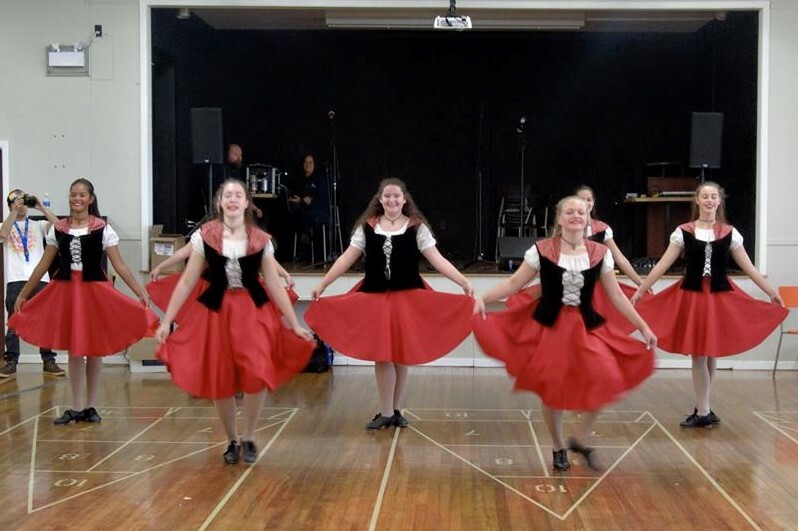 The ambiance is joyful, made special by local musicians and step-dancers, and Acadian cuisine. The sun shines brightly as we make our way to the starting line the next morning. It’s a cool 7 degrees C but it’s dead calm. A cyclist’s dream. Dozens of volunteers are there to help you park and offer pre-ride refreshments. Vehicles pour into the parking area, some with high-end gear, others carrying Canadian Tire specials. One guy rides past on a fancy time-trial bike, dressed for Arctic conditions, right down to the face mask! Elva insisted on getting her picture taken with mascot Al-Fondo. The starting area is empty when we arrive but it soon fills to bursting. The excitement grows as 8:30 approaches. The 160-km riders are sent off and I say goodbye to Elva before lining up with the Gran Fondo group, ready to start my 117-km trek. I greet several fellow Islanders in the marshaling area, wishing them a safe ride. And then we’re off, a gaggle of cyclists funneling through the start-finish line and onto Highway 1. I make my way up to a couple of Charlottetown acquaintances, Dwayne Doucette and Tom Crowell, and we ride together for a few kilometers, sorting ourselves into a group. An experienced paceline rider like me searches for allies willing to keep a civilized pace and take a turn on the front. I take mine and bridge across to a very strong rider, catching him before we pass the massive church of Pointe-de-l’Église. He leads us to the turnoff at Saint-Bernard and the three Islanders take turns as we roll along Highway 340 through Ohio and Weaver Settlement. Although the ride includes only 500 metres or so of climbing, the hills through Havelock and New Tusket prove a bit of a test. We’re joined by a group of ten or so riders doing the 160-km Super Gran Fondo; they stay with us to the turnoff at Corberrie Catholic Church. The stretch of road from Corberrie to Concession is one of my favourites: tree-lined, smooth, gently-rolling. We take the sharp left turn at the rest stop in front of La Shoppe Verte and roll past Lac Innocent. After taking another sharp left onto the Saulnierville Road and a right onto the Bangor Road, we mingle with riders doing the 30-km Piccolo Fondo. Some walk their bikes up the steep hills. I admire them, knowing they’re working every bit as hard as I am. As we pass the old Bangor Sawmill, people line the road, ringing cowbells and waving Acadian flags. I see the sign for Saulnierville Station and sing Kenneth Saulnier’s song, M’en allant par Saulnierville Station, in my head for the rest of the ride. We ride in a group of six or so until we hit the Division Road. I look around and we’re down to two, myself and Rob Bonney from Bridgewater. We turn in to the rest stop at École-Stella-Maris and take on food and drink for the last 30-km stretch. I see a couple of riders speed by the rest stop and try to catch them. Rob and I ride at a steady pace and bridge across to Charles Leonard and François Gazzano, two riders we’d been with before, and the four of us take turns at the front. The pace is quite fast but my legs are feeling pretty good. I climb the hill at Mavillette, my undoing last year, still with the group of four, and we turn onto the John Doucette Road, descending, the beautiful Mavillette Beach off to our left. Back onto Highway 1, Rob and I lose contact with the two stronger riders. With about 20 km to go, I get down on the aero bars and start emptying the tank. My back is killing me and the lower position helps. Aided by a slight three-quarter tailwind, I roll into Meteghan and onto flatter ground, tailor-made for an old time-trialer. People watch as I roll past but I’m focused only on the finish line. I can see Leonard and Gozzano but know I won’t catch them. I welcome the sight of Sacré-Cœur Church, knowing it’s all downhill from there. I pass one last Gran Fondo rider just before the finish line and breathe a sigh of relief as I hear my name on the loudspeaker: “Jean-Paul Arsenault de Charlottetown”. Elva is there to greet me and tell me she had a great ride. I wait for Rob Bonney to cross the line, followed shortly after by Dwayne Doucette and Tom Crowell. I thank them for sharing the load. Elva and I talk with Charles and Giselle Duguay from Charlottetown, remarking on how this place feels like everywhere else in l’Acadie, warm, welcoming, proud, and full of life. We load the bikes and the rest of our stuff and make our way to the lobster tent, tired but starving. It’s the best lobster we’ve had this year. And we earned it! There are many Gran Fondos, but none quite like this one. My Prince Edward Island cycling companions and I rode the Marco Pantani Gran Fondo in Cesenatico, Italy, on September 2. It was a challenging ride featuring a couple of very tough climbs but it wasn’t nearly as much fun. The Italian cycling culture is almost too serious. And here’s one example of just how anxious the Gran Fondo Baie-Saint-Marie are to please. My size L cycling jersey was one size too small, so I asked to exchange it when we registered on Saturday. “Sorry, we have none left,” replied the woman behind the desk, “but I’ll take your number and phone you if we get one.” Sure enough, my phone rang that evening and I picked up my XL the morning of the ride. You can’t beat that for service! Elva and I have struggled a bit with minor health issues this summer, but we still recorded pretty good results. She finished the 67-km Medio Fondo a good seven minutes faster than last year, 47th of 369 riders and second-fastest woman in her age group. I finished 12th of 294 riders in the Gran Fondo, first in my age group and about a minute slower than last year. Explanation: one more turn around the sun and not having Tabatha and Arend TeRaa to pace me like last year! Riccione, a city about the size of Charlottetown located on the Adriatic Sea two hours south of Venice, bills itself as a cycling mecca, and deservedly so. Each year, the Over the Hill Gang (OTHG), heads off-Island to participate in a ride. We’ve been to Nova Scotia, New Brunswick, Québec, Maine, Ontario, Spain and France. Several members of the Island cycling fraternity have been to Riccione and raved about the experience. This year, we decided Italy was the place to go. Our CEO (Chief Experience Officer), Ira Birt, organized the trip and most of us signed up: Russ Melanson, John MacQuarrie, Richard Birt, Mark Grimmett, and myself from OTGH. Elva and Ira’s wife, Liz, came to ride while John’s wife, Valerie, and Richard’s wife, Joan, did the tourist thing. Our trip actually began in Bologna. We landed there mid-day with Liz and Ira, took the shuttle into town and loitered in the street until our respective hotel rooms were ready. Not having slept more than a couple of winks on the flight over, we weren’t in the mood for action the first day; just a good bed and a decent meal. I got a nasty surprise when I opened my luggage to find my beloved S-Works helmet crushed by what could only have been a determined stomp from Mr. T! We met up with Ira and Liz and found a nice, cozy spot to dine al fresco on typically delicious Italian cuisine. Of course, we tried the bologna, called mortadella in Italy. It was tasty but not nearly as good as Maple Leaf, and the Italians only serve it cold. They don’t know what they’re missing! Next morning, we took a city bus to the base of the hill topped by the eighteenth-century Sanctuary of the Madonna of San Luca, a UNESCO World Heritage Site. We walked from the bus stop along the 3.8-kilometer roofed arcade and were rewarded with a wonderful view of Bologna and the surrounding countryside. Back in the center of the city, we walked to the magnificent San Petronio Basilica, the largest brick church in the world, and viewed the quirky Due Torri, two leaning towers built in the early twelfth century. That’s what happens when you go with the lowest tender! We arrived at our hotel in Riccione, the Fedora, at noon on Day 3 and were met by the owners and their staff; excellent first impression. Claudio, an avid cyclist himself, soon had the four of us fed, watered and on our bikes, pedaling through the gorgeous Italian countryside. The traffic was heavier than we experience on the Island, for sure, but we had excellent guides to show us the way. A 53-kilometer ride for Ira and me; a little shorter for Liz and Elva. The rest of our group arrived in Riccione late that afternoon. Next morning, after a delicious buffet breakfast, eight of us headed out along the seaside promenade and turned inland. Along the way, the boys stopped for coffee. Elva and Liz took a shorter route with their guide. The computer registered 69 kilometers when the six of us got back to the hotel. We’d trained hard for the feature event of our trip, the Marco Pantani Gran Fondo, but nothing on our island could have prepared us for the climbs. Claudio dropped us off near the start line in Pantani’s home town of Cesenatico and we lined up for the 7:30 send-off. Mark was registered for the 147-kilometre event, we six for the 110 medio, and the girls for the 73-kilometre corto. One can’t help but get caught up in the nervous energy at the start of these events. About 800 riders rode westward out of town and toward the looming hills. The first 50 kilometres were piss-plate flat. We rode with a couple of groups and paced ourselves. Not long after rolling through the small village of Piavola, the road took a sharp left turn and the wall loomed before us. There are hills just as steep on PEI but they don’t run for 8 kilometers at an average ascent of 8%. 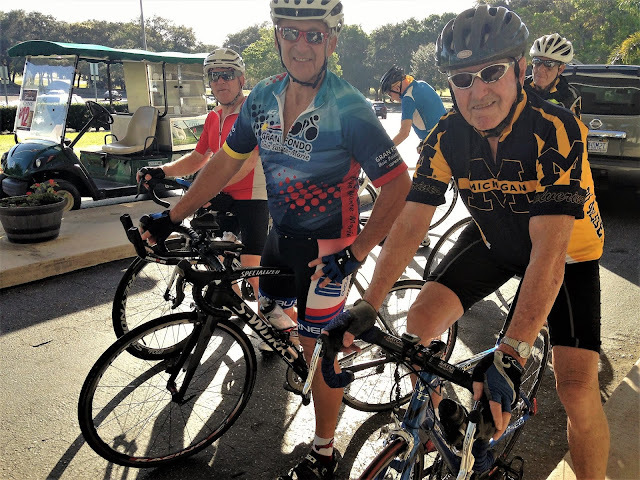 Seventy-one-year-old Russ showed the way, pedaling like the spring chicken that he is while I brought up the rear, the lanterne rouge in cycling parlance. We stopped briefly at the top for a snack and white-knuckled it all the way down the other side to the village of Mercato Saraceno. After rolling quite comfortably through the valley, we were directed to turn sharp right and start the second major climb, a 4-kilometer kicker that was far steeper in places than the first. Once again, our éminence grise led the way. We stopped at the summit, thinking the climb was over, but it wasn’t; another 5 kilometers or so of up and down awaited before we finally descended back onto flat land. The last 20 kilometers were quite easy, although our legs were getting a bit soft, and we were glad to cross the finish line. Mark came in a short time later, having registered an impressive result on his ride: seventeenth in his category. Elva and Liz did the 73-kilometer ride and, although they didn’t particularly enjoy the long climb, they got along just fine. We soon learned that we’re not in the same league as Italian cyclists, most of whom have been riding since they could barely walk. The cycling culture’s very strong here, and we’re envious. Liz and Elva did win a prize, for the two women who traveled farthest for the Gran Fondo. The event was very well organized and, although it was an open course, traffic control was excellent. We were impressed. On Day 4, Claudio proposed a 60-kilometer jaunt to San Marino. Tired and sore, we left the hotel at 9:00 sharp and headed west across the coastal plain. We crossed the invisible international border at the small town of Faetano. You can see the capital city, also called San Marino, from quite a distance and it is a very popular tourist destination. Elva and I had visited while on a cruise in 2013. The climb to the top is about 10 kilometres; I made it to 8 or so and decided that was far enough. If you look closely at the photo below, you might just make out the three fortresses along the crest of the ridge, Monte Titano. I snapped this shot on the way up. Small countries fascinate me. San Marino is not the smallest in Europe. At 61 sq. km., it’s bigger in fact than Monaco and Vatican City. Founded in AD 301 by a monk called Marinus, it’s the world’s oldest republic. Economically, it relies on financial services and tourism, and boasts one of the world’s strongest economies. The country remained neutral during World Wars I and II, having employed the same strategy to avoid capture by Napoleon’s armies in 1797. Not a bad approach, if you ask me. I wonder whether the republic to the south of us will last as long! On day 5, the two Birt couples, and Elva and I decided to play tourist. We took the train from Riccione to Ravenna to see the world-famous mosaics and were not disappointed. The city boasts eight UNESCO World Heritage Sites and we were able to visit four of them: the Baptistry of Neon, the Mausoleum of Galla Placidia, the Basilica of Sant’Applinare Nuovo, and the Basilica of San Vitale. All were built in the late fifth and early sixth centuries and feature incredibly detailed mosaics with, as one might expect, religious themes. We also visited Saint Francis Basilica, site of Dante’s tomb. Mosaic art predates the forms of art we’re most familiar with — frescoes, oils and watercolours — and Ravenna has the best. Day 6 came too soon. The boys ordered an 80-kilometer ride with little climbing, and that’s exactly what our guide, Paolo, delivered. We headed inland and climbed to the border of San Marino, then turned to the northwest, stopping at Santarchangelo di Romagna for coffee. We followed the Rubicon River for quite a distance, rolling along at speeds in the mid-30’s, enjoying flat ground and light traffic; well, except for one idiot who didn’t want to share the road! We reached the Adriatic at Gatteo a Mare and headed southeast, following the coast as we went. We stopped for a short time in Rimini to take in some of the historic sites and were glad to get back to the Fedora where a sumptuous lunch awaited. Elva, Liz and Joan took the bus to San Marino and had a very enjoyable day. 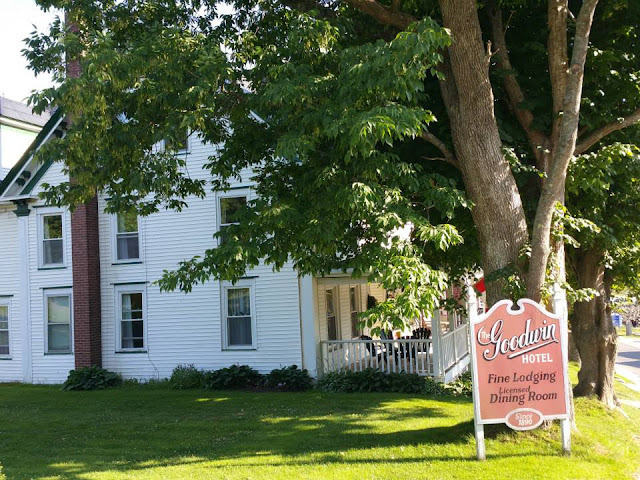 The Hotel Fedora may only be a three-star but the service was five-star all the way. 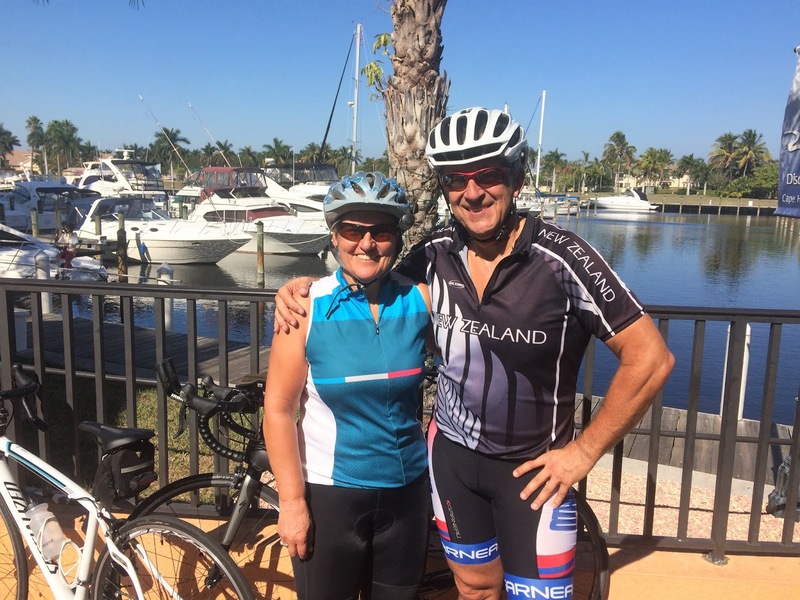 Claudio manages a well-trained team that understands what cyclists are looking for in an active vacation. It’s also a very popular spot with young families. The food, all three daily meals buffet-style, was better than Elva and I have had on Holland America cruises, and the bikes were excellent. Time spent with OTHG is very special to me and bringing the girls along turned out to be a good idea. I rode over 375 kilometers and can't wait to do this again! From Lanzerote Island, we sailed west to Agadir, a major city in southern Morocco. Our first impression of the country, gained from a one-day visit to the Mediterranean port of Tangier in 2015 years ago, had been rather negative. We hoped for better. We learned that Agadir was rebuilt following a major earthquake in 1960 that killed one third of its residents. It is now the largest seaside resort in Morocco. We strolled along the broad seaside promenade and the beautiful white sand beach. The contrast between locals dressed in traditional Muslim garb and scantily-clad tourists and beachgoers was interesting to see. Men wearing Berber blue and sporting colourful turbans trotted up and down the beach offering camel rides. Elva and I had decided it was time to start getting back in shape, so we walked up the steep, winding road to the Casbah (castle), originally built in 1572 to guard the harbour. Buses and taxis bearing fellow passengers rumbled past us on the way up and down. They must have thought we were nuts! From the top, we enjoyed the same views of the city and the Atlas Mountains as they did and were the better for the hike. An overnight sail landed us in the port city of Casablanca, famous for the 1942 Humphrey Bogart movie of the same name. As well as being the largest city in Morocco, Casablanca is one of the most important cities in Africa, both economically and demographically. From the ship, the port looked as big as any we’d ever seen. A major shortcoming of every city we’ve visited in Africa is the absence of reliable tourist information services. There was no city map to be found at the Rabat train station, so we headed in the direction of the nearest mosque and just followed our noses. Elva stopped to take a photo of an orange tree and was warned by a gun-toting soldier to cease and desist. Apparently, his job was to guard some government building from dangerous camera-wielding Canadian tourists. We walked past the Palais Royal and up toward a gate that circles the old part of the city. Jackpot! Just across the intersection stood the Chellah, a UNESCO World Heritage Site dating back to the time of the Phoenicians, occupied later by the Romans and, finally, chosen by Muslim rulers in the thirteenth century as their sacred necropolis (burying place). Next challenge: get across the frantic intersection without ending up on the hood of a car or the front wheel of a motorcycle. After a couple of close calls, we crossed the threshold of the fortress and entered a peaceful refuge featuring beautiful gardens, interesting archaeological digs and, best of all, nesting storks. Dozens of them! We spent barely two hours in Rabat before taking the train back to Casablanca, but it was worth the journey. While Moroccan trains are not on par with their European counterparts when it comes to cleanliness, they do run on time and are cheap. The return trip cost less than $25 CDN for the two of us. Good thing we ventured outside Casablanca, as it turned out. The city has some interesting attractions, including the magnificent Hassan II Mosque, second-largest in the world after Mecca’s, but isn’t our kind of place. It’s frantic, dirty and loud. Many people are downright obnoxious, especially those trying to sell you something (which includes most of them). The contrast between the conspicuous wealth of the religious site and the filth of nearby garbage-strewn lots really turned us off. As has become our habit in a city that doesn’t suit us, we located the best hotel — the Hyatt Regency — marched in like we owned the place and had a beverage, relishing the atmosphere and taking our sweet time. Accomplishment of the day: 28,000 steps! Early next afternoon, the Rotterdam docked in Gibraltar. It was nice to be back on European soil again and to encounter that most essential of visitor services: the tourist information bureau! There’s no such thing in Africa. Result: you’re at the mercy of guides, hustlers and crooked taxi drivers. Why their dim-witted tourism agencies don’t understand this basic need of the independent traveller remains beyond us. Armed with a good map and all the tips required for a productive visit, we set out on foot. Our objective, as it had been on our first visit to Gibraltar three years ago, was to climb to the top of the Rock, 1,400 feet above sea level. It took us an hour to get there, following the switchback road and navigating the steps that take you through the domain of resident Barbary apes. It was a clear day and the view from the top was amazing. Again, we waved to curious Prinsendam passengers as they drove by. Back down in the main town, we hopped on a bus and went out to Europa Point, the southernmost extension of the peninsula. From there, we had a clear view across the strait to Africa. Another great day! Our next stop, Valencia, Spain’s third-largest city, is a mix of classic and modern Europe. The Ciutat Vella, old city, contains the fifteenth-century Lonja de la Seda (silk Market), a UNESCO World Heritage Site, the Mercado Central, several expansive plazas, and a variety of interesting churches and towers. We strolled on marble sidewalks on spotless streets in the old city, enjoying the sights and exploring historic buildings. Then we hopped on a bus and explored the impressive Ciudad de las Artes y Ciensias, the City of Arts and Sciences, a post-modern assemblage of incredible buildings including opera house, science centre, and aquarium. One day in Valencia was just enough to whet the appetite; definitely a city worth revisiting. Too soon, the Rotterdam docked in Barcelona, last stop for us and the halfway point for those staying for the Mediterranean loop before heading back across the Atlantic to end the voyage in Fort Lauderdale. It was our third visit to Spain’s second-largest city and the center of the Catalan independence movement. Fortunately, there was no sign of unrest as we strolled with the Sunday crowds on Las Ramblas; all was quiet. After getting kicked off the ship, we made our way to the Hotel Guell for a two-night stay. Having seen most of the city sights on previous visits, we didn’t feel pressured to hustle. Elva did some shopping and I took it easy. The one attraction on our list was the magnificent Sagrada Familia. We’d bought tickets well in advance and enjoyed a guided tour of this unique world-class building. There’s nothing like it anywhere. Of all the magnificent structures we've seen in our travels, it's one of my favourites. The first image is taken from the centre of the church, looking straight up. The second shows the exterior, still under construction. 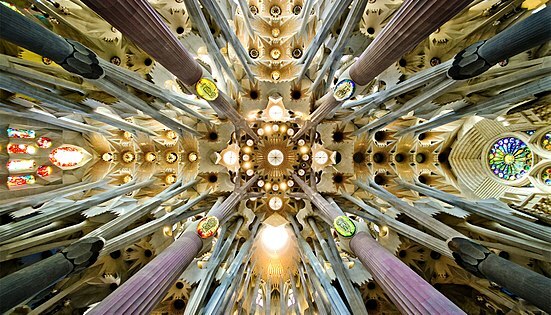 It will be completed in 2026, the hundredth anniversary of architect Antoni Gaudi's death. The central tower will rise to 172.5 metres, making it the tallest church in the world! We enjoyed our 28-day cruise aboard the MS Prinsendam. The voyage enabled us to see new places and experience new adventures. Elva and I travel best together when there’s just the two of us; no pressure, just the unbridled (and unguided) joy of discovery. For the first time in five cruises, we didn’t take one Holland America excursion. With rare exceptions, they just don’t suit us. And we enjoyed renting a car to explore a couple of islands in the Canaries. As for fellow passengers, we learned that the Prinsendam enjoys a sort of ‘cult’ following — guests who love the ship and sail on her and her only. Some have been sailing together as a group for many years. Many love the ship so much they don’t even bother getting off when she reaches a new port! As for the age of this particular crop, we estimate it to be in the very high 70s, if not 80. Many were over 90. One man was a World War II veteran. A couple celebrated their seventy-second wedding anniversary during the voyage! We’ll sail with Holland America again, for sure. Their itineraries, level of service, and value for money all suit us. We’ve learned how to make the most of the ports of call by travelling independently, sometimes with another couple when the situation calls for it. As for the age of passengers, not to sound ageist, but a little younger would be just fine. In the short time we were away, two members of our immediate family suffered serious health setbacks. All the more reason to begin planning the next cruise, maybe in the fall of 2019. There are so many places we still want to see… And we have much to be thankful for. Time to go home, reconnect with family and friends, sweep the snow off the car, grease the bike chain, and dust off the ole fishin’ pole. Jean-Paul Arsenault. Simple theme. Powered by Blogger.